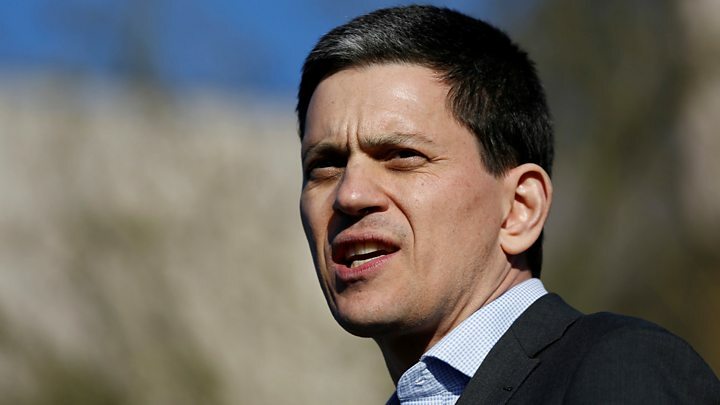 Former Labour leadership contender David Miliband says he "grieves" for the state of his party, which the public perceives is "going backwards". He refused to say if Jeremy Corbyn should resign or who could replace him, but said he was encouraged "there are so many talented people in my party". "The big thing in politics is not to define your own reality and then fits the facts to it," he added. He made the comments in an interview with BBC 5 live's Emma Barnett. Mr Miliband, who lost out on the Labour leadership in 2010 after being defeated by his younger brother Ed, is now president and CEO of the US humanitarian aid charity International Rescue Committee. He warned the party if it did not reach out beyond its own tribe it risked becoming "a sect and that is very dangerous". "I grieve for the state of the Labour Party - that's obviously the case," he said, adding: "I am of course very committed to Labour politics." Asked how he would respond if the Labour leader begged him to become a member of his team, he replied: "I think that is the stuff of Jeremy Corbyn's nightmares - not the stuff of his dreams." Pressed on whether he thought Mr Corbyn should quit, he said: "The big thing in politics is not to define your own reality and then fit the facts to it. "It's to look at the world in a clear way and apply your values. Obviously the great fear for Labour supporters is the public perceive us to be going backwards... My quarrel is not with Jeremy Corbyn's personality, it's with the strategy." As to any potential replacement for Mr Corbyn, he said: "The thing that encourages me is that there are so many talented people in my party... too many of them, you know, many of them, are not in leadership positions - but that's life." Speaking before former Labour London mayor Ken Livingstone was suspended from the party for comments he made about Adolf Hitler and Zionism, Mr Miliband said he "never believed we would see the day when anti-Semitism and Labour were being discussed in the same sentence". On Brexit, he said he did not think the prime minister would be able to secure a free trade deal within two years. "No-one who has worked on trade or European issues believes that, and I don't think Theresa May believes that either because she's already said that she needs a transition period. "She's basically said: 'Look - let's get to the two year mark, but have the transitional period that allows for adjustment', and frankly that adjustment is going to involve an awful lot of the detailed work on what it means to de-conflict and de-couple British regulation from international regulation." Asked about Donald Trump's proposals to reduce the US foreign aid budget, he said: "As someone who has an organisation of 13,000 staff on the frontline, I am genuinely fearful of an American retreat from historic commitments - not just to make the world a fairer place, but also to make the world a safer place."